Whoa, how did September creep up on us so quickly? 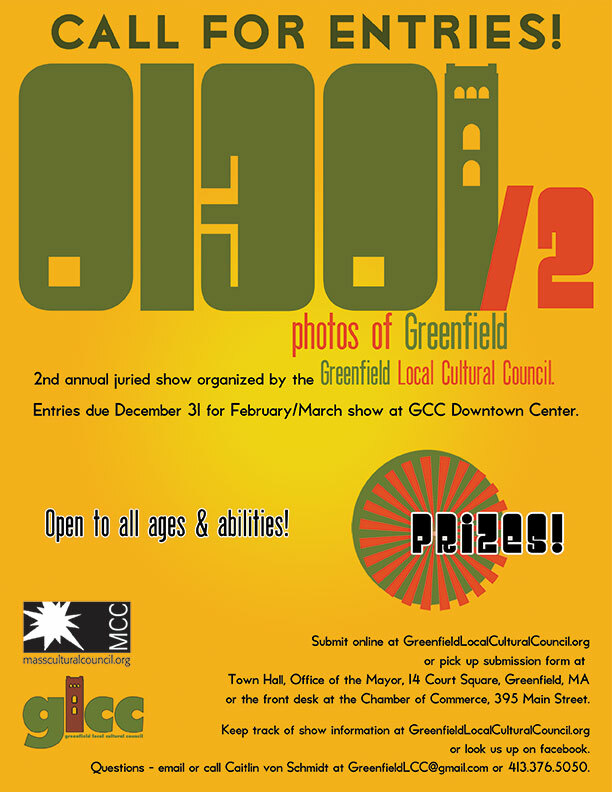 We’re waiting to find out this year’s grant allocation from the Mass Cultural Council, at which point our grant cycle will officially open. We’ll let you know as soon as that happens. In the meantime, you could do us a huge favor by filling out this online survey. We’d like to find out how you think we’re doing, and how we might be able to better help both grantees and the folks who enjoy what grantees do. Thanks for giving us a hand! Since this is on the wall of the Coop, a theme of “Our Community Involvement in Sustainable Food Systems” is being suggested. Participation is open to anyone who lives or works in Franklin County and is 19 or older. First draft proposals should be submitted in jpeg format by email by April 22nd. The committee may select up to three designs and ask the artists to present a final draft of their design for final selection. That selection will be done by the committee with final approval by a representative of the coop. by May 1st. Installation will begin as soon as weather permits, usually around Memorial Day. We expect the mural to be completed within a month. There will be a $750 award for the winning design, which will be presented upon completion of the mural. We would like the installation of the design to be a collaborative effort, with the artist being in charge of layout, final touches, and completion of the project, while supervising others who want to participate in the painting. The full RFP can be downloaded here: Word. PDF. 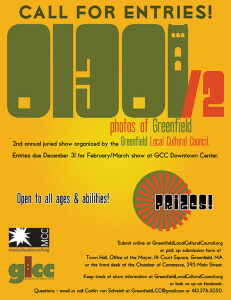 This is a great opportunity to make a beautiful impact on downtown Greenfield! Yes, it’s October 15 already! How did THAT happen! 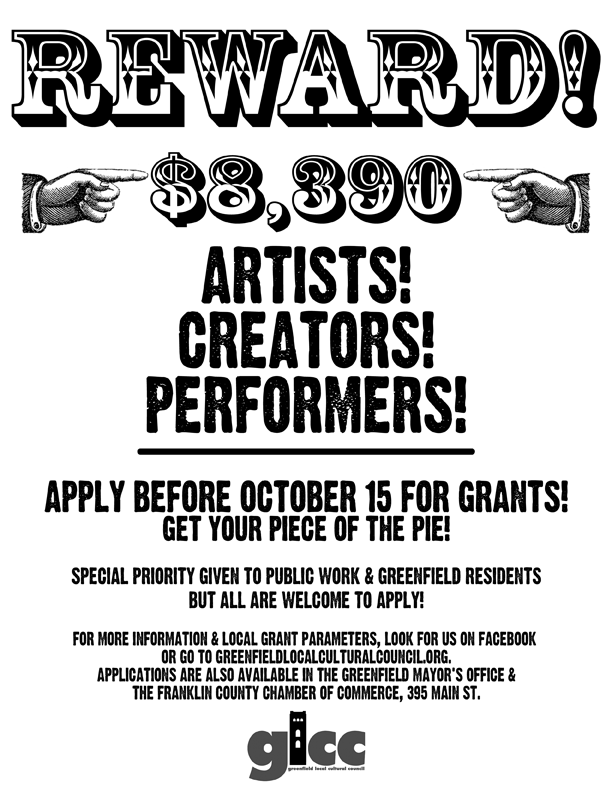 That means that GLCC grant applications are due today. Make sure to either drop them off at Greenfield Town Hall or the Chamber of Commerce, or get them into the mail so they’re postmarked today. 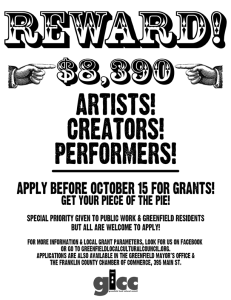 We really want to see your applications – help us help you make Greenfield an even cooler place!